2015-2016 Season Roster Update AVAILABLE NOW! This is likely be the final roster update I do on the PSP. Please send $5 USD through Paypal to aronvad@gmail.com and include your email address where you'd like me to send you the roster files. 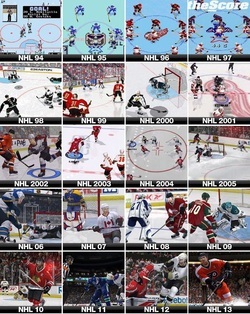 NHL 07 : Because we're still waiting for 08, 09, 10, 11 & 12 & 13 & 14 & 15 & 16 to be released! Welcome hockey fans! Unfortunately, the PSP hockey gamer has been overlooked in recent years by the Video Game industry. The latest hockey game for the PSP is NHL 07. It's not without flaws and blemishes, but it's what we have to work with. Until EA releases a new game (don't hold your breath) I will take it upon myself to create an accurate roster for each NHL team. Rather than keeping this to myself, I decided to share it with others for their enjoyment. Out of respect for the hard work I put in, I ask you to not use this as a base for your roster to share. If you would like to purchase your season pass you can by sending money to aronvad@gmail.com on paypal.